Caregiving can be one of the most demanding – and rewarding – responsibilities we take on in life. 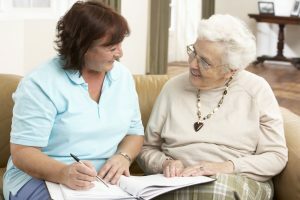 Care coordinators (also called care managers or geriatric care managers) are there to provide expertise and to do what you can't do for your loved one when you are geographically separated or when you are busy with your own family, career, or other responsibilities. If you’re not sure which solution is right for you, the geriatric care managers at Care is There can help you and your loved one: understand the options, choose an approach and a particular service provider, monitor progress and suitability, and make adjustments as necessary. We visit your loved one often and stay in close contact with you throughout the process, which is especially helpful for long distance caregivers. Contact Care is There Geriatric Care Management for a free consultation!